Problem Statement: Design a device that holds a cup still. This idea comes from the concept that a cup and its lid are extremely hard to get off with only one hand. This is because the user must hold the cup down with one hand and twist with the other. 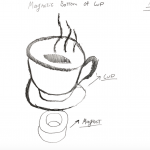 A magnet attached to the bottom of a cup would hold a cup down so the user could twist off a lid easily with one hand. Problem Statement: Design a device evenly distributes weight. 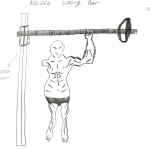 This is a design for a weighted bar used at a gym. The idea comes from a Smith machine. It takes half of a Smith machine and attaches it to one half of the bar. This allows for the user to maximize their use of the bar with only one hand since the weight on the bar is distributed equally. 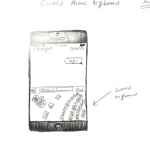 Problem Statement: Design a solution that makes typing on a phone easier. This is a curved keyboard designed for a phone that allows the user to fully reach all keys with their thumb. The curvature makes it so that the user does not have to stretch their hand to reach keys that would normally be on the far left side of the phone.